formal classroom training, practical hands-on training, and evaluation. We knew we could help with that. 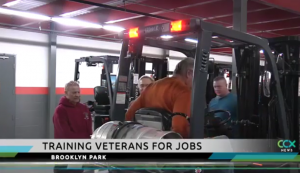 Toyota Lift of Minnesota has been working to assist the veteran through veteran forklift certification and veteran employment programs. About two years ago we hired US Army tank mechanic Kevin Rotzien to work with us a service writer and IT support. Kevin has brought much to our service department and customers with his dedication and attention to detail in his position. Not that long ago we were surprised to see that Kevin and his family received an extra boost by his local community. We wanted to share that story here.